Securefindersearch.com is the PUP that uses misleading techniques to prevent removal. Use Reimage to locate malicious components and get rid of them faster than with uninstall instructions. A full system scan blocks virus reappearance and prevents traffic to malicious domains. How does Securefindersearch.com hijack computer systems? One more suspicious browser hijacked has been spotted and added to our database of spyware threats. This potentially unwanted program (PUP) is better known as Securefindersearch.com virus. We have noticed that computer users have a tendency to call it like that due to its suspicious and annoying activity, though it is is not malicious. 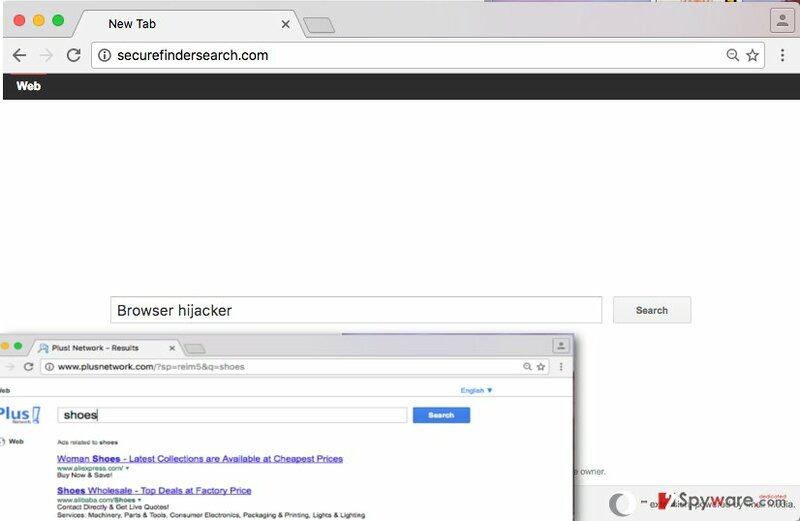 This browser hijacker does not ask the user if he wants to change the homepage address and changes it anyway; besides, it can assign Securefindersearch.com URL as the default new tab page address and also alter default search settings to make the user go to Securefindersearch.com search results every time he or she looks for information online. Such redirections and unexpected changes in browser settings can displease you, and that is a completely normal reaction. If you do not like such changes in your browser, remove Securefindersearch.com redirect virus using the anti-spyware app. If you do not have one, use Reimage or Plumbytes Anti-MalwareMalwarebytes Malwarebytes – we can rely on them so we believe that you should, too. However, the biggest problem related to this browser hijacker is not the fact that it changes some settings in the browser without asking user’s permission. A much more frightening reality is that the search engine provided on the new homepage is likely to be dangerous, especially for inexperienced computer users. It appears that this search tool reroutes users to plusnetwork.com results page, and this search engine is believed to be untrustworthy. Beware that unreliable web search service providers might not necessarily filter sponsored results they display, so keep in mind that clicking on search results brought by them can be dangerous and point to insecure places on the Internet. You will soon notice that the results page is filled up with entries that are marked as “Ads” – you will see them above and beyond organic search results. According to the developer of this questionable browser hijacker, IMALI -N.I. MEDIA LTD., the search tool presented on the Securefindersearch.com site can include links to other third party sites, which might present different policies, besides, such sites can “carry advertisements or offer content, functionality, games, rewards programs, newsletters, contests or sweepstakes, or applications developed and maintained by third parties.” A scary fact is that this company does not endorse content that third-party sites publish, so in other words, it does not filter what sites it advertise and what content they present. This means that you can be easily redirected to a bad website and interact with its content freely without being warned first! If you do not want to be thrown onto suspicious Internet sites, think about Securefindersearch.com removal options. There are two – the manual and the automatic removal option. If you wish to find out how does Securefindersearch.com redirect virus spread, read this paragraph carefully. It seems that Securefindersearch.com hijack occurs when the user fails to install another free program safely. Typically, free programs travel together with other programs to be installed on the system silently. You probably seek for the answer how and when does that happen. They are distributed alongside other programs and presented as “recommended downloads.” The sad truth is, people think that additional downloads suggested by software installers are as trustworthy as the program that they have downloaded. That is not true. Typically, programs bundled with other software appear to be highly annoying ad-supported applications or even rogue programs that can hardly can provide useful functions. To check if you download includes such programs, open Advanced or Custom settings in the software installer and once you are here, deselect all offers to install additional programs or make changes in the system. Here, look for Securefindersearch.com or any other recently installed suspicious programs. Wait until you see Applications folder and look for Securefindersearch.com or any other suspicious programs on it. Now right click on every of such entries and select Move to Trash. [GI=google-chrome]Go to browser extensions using instructions listed here. Uninstall Securefindersearch.com virus by removing unwanted extensions. Here, select Securefindersearch.com and other questionable plugins. Click Remove to delete these entries. Now you will see Reset Firefox to its default state message with Reset Firefox button. Click this button for several times and complete Securefindersearch.com removal. This entry was posted on 2016-09-27 at 04:07 and is filed under Stealing programs, Viruses. You can quickly scan the QR code with your mobile device and have Securefindersearch.com virus manual removal instructions right in your pocket. How did you remove Securefindersearch.com virus?